Very few people visiting Granada get to miss this building, mainly because it sits beneath the Alhambra by the Rio Darro – a popular place to stroll along before perhaps heading up the steep, narrow streets of the Albaicin. It doesn’t seem to quite ‘fit’ Granada and would seem more at home in Paris. Despite its current state, it is handsome and looks like a doll’s house. If a horror film has ever been made about the place we wouldn’t be too surprised. Opening in May 1910 and built on the site of an old esparto factory, Hotel Bosques de la Alhambra only lasted a few years until it was closed down. You’d think nestled among the trees and so close to the Alhambra it was on to a winner, but no. 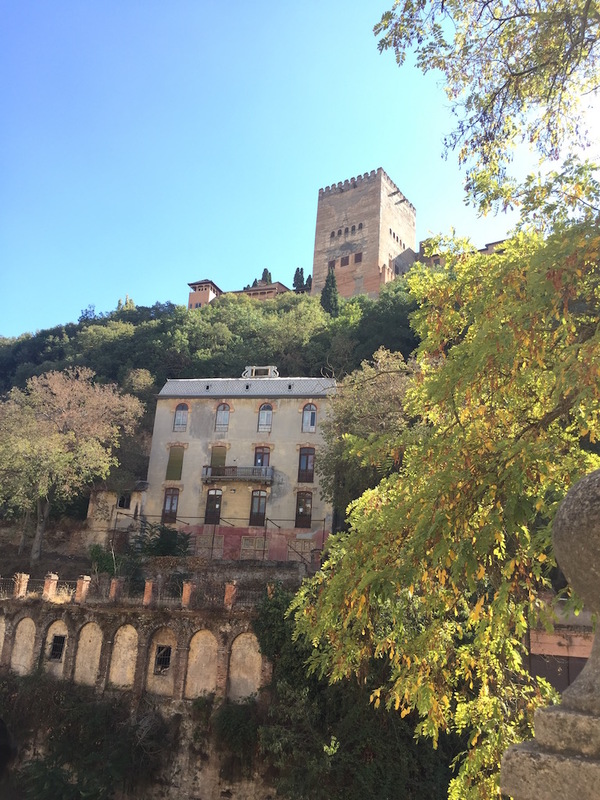 Its position – with a limited amount of sun and near a river (with, no doubt, the Alhambra’s own water finding its way down the slope behind the hotel) – meant one thing: dampness. It didn’t help that the whole building was constructed of wood which acted like a sponge. Guests found their bones aching and the humidity in the warmer months unpleasant. It attracted the nickname ‘La Rheúma‘ (rheumatism). The building went through many uses over the years including accommodation for students, a hospital during the Spanish Civil War, dressing rooms for actors and, on the lower floor, a workshop for making soap. It’s getting on for 20 years since the building was bought by the powers-that-be in Granada and, like many things that are waiting for the authorities to finish eating their bocadillos and actually do something – there are plans to renovate it. Thankfully it escaped demolition years ago as ‘The Suitcase’ – as it was also nicknamed – certainly catches the eye as you walk along the Paseo de Los Tristes. The area behind the building, largely hidden from view, has an orchard where, rumour has it, the composer Manuel de Falla enjoyed evenings over a glass of vino with the poet Lorca. It looks spooky and has stories to tell; from strange graffiti on the walls, faces at the windows and a ‘special’ energy. And at night the dark windows and arched chambers above the river’s walls – set among the orange, floodlit facade – certainly do get the imagination racing. But with the bustling bars opposite with their clinking glasses and laughter, you’re back enjoying the beautiful streets of Granada in no time. Visit it today with no knowledge of the place, you’d wonder why the building remains empty with bricked-up lower windows and decrepit balconies. The nearest you can get to it is by crossing the Puente de las Chirimias (Bridge of the Pipers). In the short clip below a bride and groom can be seen across the Darro, whispering sweet nothings to each other and planning the conception of their first (or maybe second) child. Let’s hope this old, sad building has a bright, dry future – with, or without, its ghosts. Gosh what a fab description ….am fascinated …!